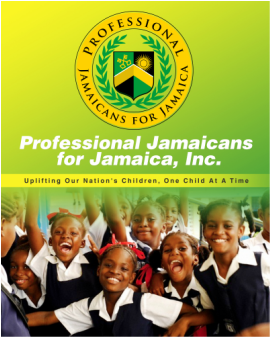 Organization Overview - Professional Jamaicans for Jamaica, Inc.
Professional Jamaicans for Jamaica, Inc. is a 501(C)(3) Tax Exempt Organization which was created to address the economic and education needs of children who are challenged socio-economically and socially. The goal of the organization is to identify students who excel academically in school, but lack financial and moral support to pursue their goals, and to also provide scholarships to assist with their needs. We also target teenage mothers and offer entrepreneurial and personal development training. We understand that if children are to become adults who are committed to a stable and safe environment, where all citizens can self-actualize and pursue happiness, then urgent intervention and continuous support are required. Unfortunately, the inescapable realities of challenged communities expose many gifted students to the possibility of not completing high school and also develop anti-social behaviors. The organization understands that students must be held accountable for the role they will play in their own success. However, before students can be held accountable, their basic needs must be met. Studies show that students who do not eat breakfast are less likely to perform well in school. Studies also show that students who flourish academically, usually do so in environments where they feel safe and where they feel that their teachers care about them. Unfortunately, many students to school without breakfast, and worse, are exposed to less than ideal learning environments. PJFJ seeks to affect change in these areas.